Take a chauffeur driven tour of Puglia, Basilicata and Campania, steeped in Etruscan and Greek sites. 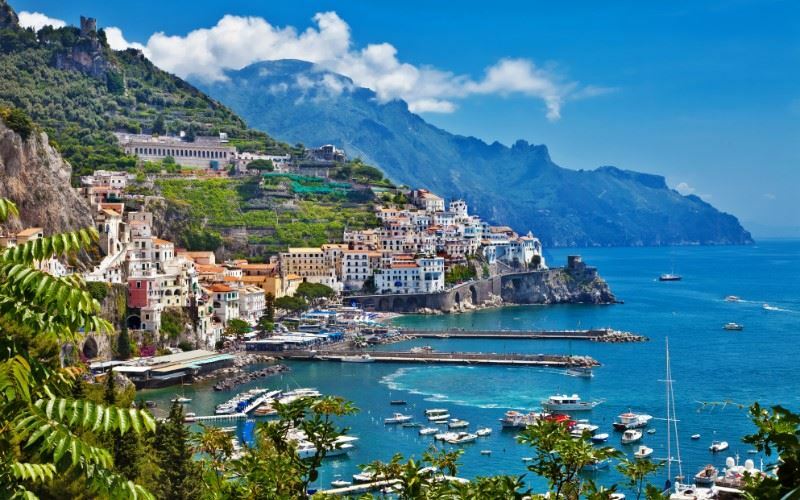 You will have the expert guidance of official guides in Lecce, Otranto, Matera and Paestum and experience some of the best coastal drives along the Amalfi Coast passing through the towns of Positano, Ravello and Amalfi. Arrive at Bari airport, meet and greet by your personal driver and transfer to your hotel in Alberobello. Alberobello is a UNESCO World Heritage site and home to a dense concentration of Trulli limestone cottages with cone-shaped roofs built between the mid 15th and late 18th centuries. It is one of the best preserved urban areas of its type in Europe. Overnight at Grand Hotel Olimpo, Alberobello. Overnight at the Grand Hotel Olimpo. After breakfast, you will be chauffer driven through the Itria Valley, to the picturesque Locorotondo – known as one of the most beautiful villages in Italy; Cisternino, a medieval walled city where you can stroll back through time on worn, stone-paved lanes between ancient palaces, towers, shops and homes that are mostly still in use today; Ostuni, the old citadel is built on top of a hill surrounded by ancient walls and is commonly referred to as the White Town (Città Bianca) for its white walls and white-painted architecture; and the baroque Martina Franca, the pearl of Valle d’Itria, a hilltop town whose historical centre is surrounded by stone walls, with prominent baroque gates that lead to piazzas and narrow medieval streets. Lunch (included) will be at a farmhouse where the region’s celebrated olive oil and wine will accompany your meal. Overnight at Patria Palace Hotel, Lecce. Today you will have a half day guided walking tour of Lecce. Affectionately known as the ‘Florence of the South’ due to its many Baroque buildings, Lecce has a Roman amphitheatre, more than a hundred churches and palaces and several designer boutiques. The city’s heyday was when it was part of Spain in the 17th century and the noblemen, merchants and religious orders of the city competed with each other as to who could build the most palaces. Carved from the local golden sandstone, the exuberant architecture looks like a sumptuous theatrical set. Lunch included. Afternoon at leisure. Overnight at Patria Palace Hotel, Lecce. After breakfast, depart Lecce for Matera (c.2 hours drive), a UNESCO World Heritage Site and nominated as the Capital of Culture for 2019. The town centre, the oldest part of town, was built on the edge of a bare plateau where a high rocky mount looms over the spot where a valley descends to the long deep river-ravine. This is where you will find the cathedral and the typical Italian town centre. As time passed, the rocky valley slopes below the town were dug out to create caves, used for housing, storage and stabling. These cave areas, where the poorest local peasants lived, fill a narrow valley and run along the side of the gorge itself. Matera was used as a film location for Mel Gibson’s ‘The Passion of Christ’. En route you will stop at Grottaglie, the leading centre for the production of ceramics in the region. The production is divided in two main branches, common household crockery inspired by traditional peasant ceramics, and that of highly decorated and precious ornamental pieces. Your afternoon guided tour of Matera will introduce you to the town, its cave-dwelling area known as the ‘Sassi’ and the Park of the Rupestrian Churches. There will be a visit to a cave, some 20 feet high and 100 feet deep, adorned with images of a dozen giant saints and angels emerging on the stone walls. Archangels Michael, Gabriel and Raphael float in the heavens, St Peter with St Andrew, the Virgin and Child in the company of two female saints. The most striking of all is a painting of Adam and Eve eating the apple that gives the cave its evocative name ‘the Crypt of Original Sin’. Overnight at Sextantio Le Grotte della Civita Hotel, Matera. Overnight at the Sextantio Le Grotte Della Civita Hotel. After breakfast, depart for Paestum (200km / over 3 hours journey) and the Greek city of Poseidonia inscribed on UNESCO’s World Heritage List. Within the city walls, a number of exceptional public buildings have been revealed. The most outstanding of these are the three great temples of Hera, Ceres and Poseidon. The oldest is the Temple of Hera which, like the other temples here, is Doric in style. The Temple of Ceres (believed to be dedicated to Athena) dates from 500 BC while the Temple of Poseidon was clearly inspired by the Parthenon in Athens. Lunch (included) stop with a tasting of the regions most famous cheese - Mozzarella made from Buffalo milk before meeting your local guide for a tour of the temples and museum. Then drive to Sorrento (c.2 hours away). Overnight at Antiche Mura Hotel, Sorrento. Overnight at the Antiche Mura Hotel. Explore, with your driver, the 40km coastline road winding its way from Sorrento through to Positano, the coast’s most picturesque and photogenic town with steeply-stacked houses tumbling down to the sea and lined with wisteria-draped balconies, smart restaurants and fashionable boutiques; Amalfi which lies at the mouth of a deep ravine, at the foot of Monte Cerreto, with its impressive Duomo and exquisite 13th century Cloister del Paradiso; and the enchanting town of Ravello, known for its annual music festival held within the celebrated Villa Rufolo Gardens, which is famed for being the inspiration for ‘Parsifal’, Richard Wagner’s last and possibly greatest opera. The annual Wagner opera festival takes place here between June and July. Overnight at Antiche Mura Hotel, Sorrento. Day at leisure. Sorrento is an ideal base from which to reach many of the region’s greatest treasures including Naples, Herculaneum, Mount Vesuvius and the island of Capri. Excursions can be arranged and paid for locally. Overnight at Antiche Mura Hotel, Sorrento. Transfer to Naples airport for your flight back to the UK. The Grand Hotel Olimpo is located in the UNESCO World heritage town of Alberobello, famed for its ‘Trulli houses’ – ancient, whitewashed dwellings with a distinct cone-shaped roof. A unique hotel built into the pre-historic caves of Sassi which form part of the UNESCO World Heritage Site. A unique hotel built into the pre-historic caves of Sassi which form part of the UNESCO World Heritage Site. The hotel took ten years to be converted from its former Sassi (stone settlement) to the remarkable boutique hotel it is today. The rooms are beautifully crafted using the natural features of archways, vaulted ceilings and stone flooring to provide comfortable and unique accommodation. The restaurant is set within an ancient 13th century church with stunning views over the town of Matera. Explore the ancient churches, cathedrals and museums, steep winding alleyways with a wide selection of restaurants, cafes and bars. The Antiche Mura, built within the ruins of a 17th century fort on top of a ravine, is centrally located in Piazza Tasso, known locally as ‘the lounge of the city’. The Antiche Mura, built within the ruins of a 17th century fort on top of a ravine, is centrally located in Piazza Tasso, known locally as ‘the lounge of the city’. The hotel has been stylishly and elegantly furnished in a design greatly influenced by the ‘Liberty’ period. This unique property offers spectacular views over the ‘Valley of the Mill’ and houses the remains of one of the four original towers of Sorrento. A park of citrus trees, gardens and a swimming pool adjoin this splendid hotel.